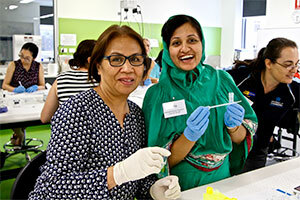 The National Science Teachers Summer School allows teachers to reconnect with their own love of science and technology. Image courtesy of National Youth Science Forum. Back by popular demand, the National Youth Science Forum’s National Science Teachers Summer School will again be delivered in January 2017 in collaboration with the Australian National University. The program offers participating teachers the opportunity to engage in a professional dialogue about teaching and learning and to explore methods of engaging students in science, technology, engineering and mathematics (STEM). Participants will take part in a variety of enquiry based workshops and activities that will allow them to explore STEM in a hands-on manner and to reconnect with their own love of science and technology. The program aims to bring science to life in an engaging, multidisciplinary manner that can be replicated in any classroom. Teachers will be able to reflect on their own teaching methods and network with peers from across the country. Presenters from across the country will be on hand to deliver workshops and lead interactive discussions during this program that will provide participants with tangible learning experiences that they can share with colleagues on return. Dr Joe Hope, Professor from Department of Quantum Science, Physics Education Centre, ANU. The National Science Teachers Summer School will be held in Canberra at the Australian National University from 9 – 13 January 2017. For more information visit the National Youth Science Forum’s website. Amanda Caldwell is the Manager, External Relations for the National Youth Science Forum.